Hip-hop, house, EDM, Top 40. Friday - Saturday 11am - 6pm. Towering plants, cabana rental, 85 chaise lounges, 35 day beds, and 8 grand private cabanas. Though the calendar may still read “winter” when some of the pool parties open, Las Vegas has its own concept of weather. Despite some cities still dealing with a plethora of snowfall, Sin City inhabitants have already swapped out their winter clothes for their more revealing attire. As the weather warms up, both tourists and locals start to scour the streets, looking for the best place to party in the warmer air. 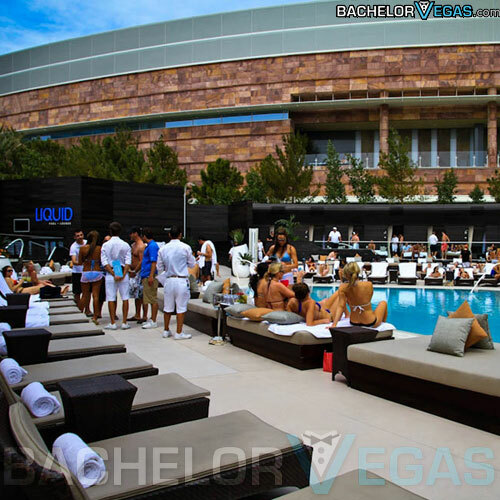 At the Aria Resort, tucked nicely into the Strip’s extravagant CityCenter, you’ll find Liquid, where not only will you find refreshing pools, but also one of the hottest day parties on the Strip. In a city that thrives on the nightlife, it was a surprise when the term daylife starting being thrown around a while back. While Las Vegas is home to the hottest nightclubs in the country, it wasn’t before long that someone thought to combine the entertainment of a nightclub with the comfort of a pool. Unlike a better portion of the public pools in the city, though, these extravagant spaces are closed off to anyone under 21, ensuring that adults have an escape where they can truly get that nightclub feel while the sun is still shining bright. Speaking of the sun, the glowing star is quite a beast during the late spring and summer months in Nevada, so having the ability to escape to Liquid’s refreshingly crisp pool water is a refreshing thought on its own. While cooling off in these waters, you’ll find yourself sucked into the ambiance, which promotes nothing but friendly conversation and safe partying. 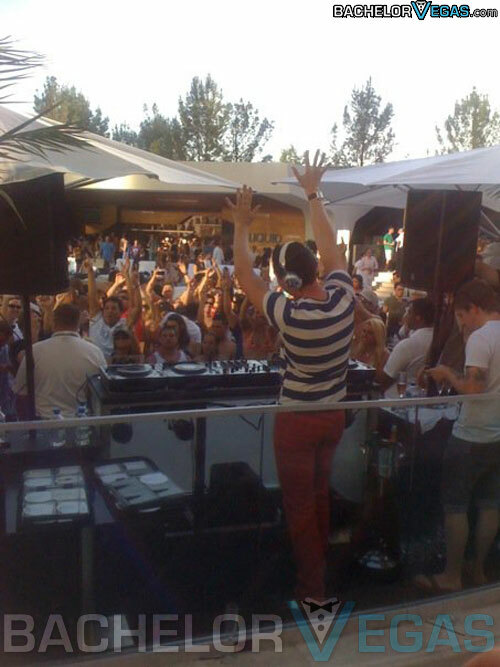 The mash-up of resident DJs keep the party alive with their continuous streams of Top 40, Hip-Hop, and Dance music. The sounds are infectious, so don’t be surprised if you start moving along with the beats unexpectedly. The true charm about this pool lounge is its size. 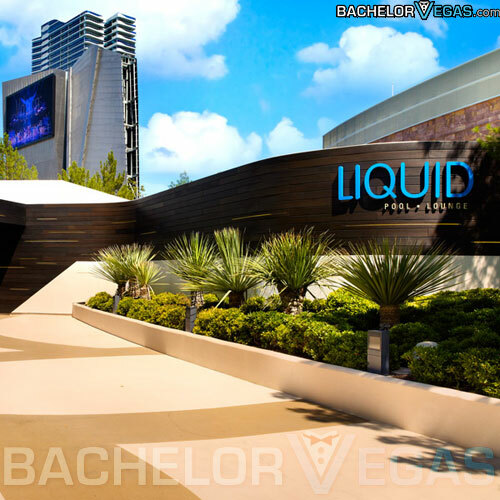 While most pool clubs in Las Vegas tend to range well above 40,000 square-feet, Liquid Pool Party comes in at an astonishingly tiny 16,000 square-feet. Regardless, there’s nothing that puts it a step behind the rest of the pools. It’s actually its smaller size that allows for a tighter knit, intimate affair where you may make a few new friends and acquaintances. 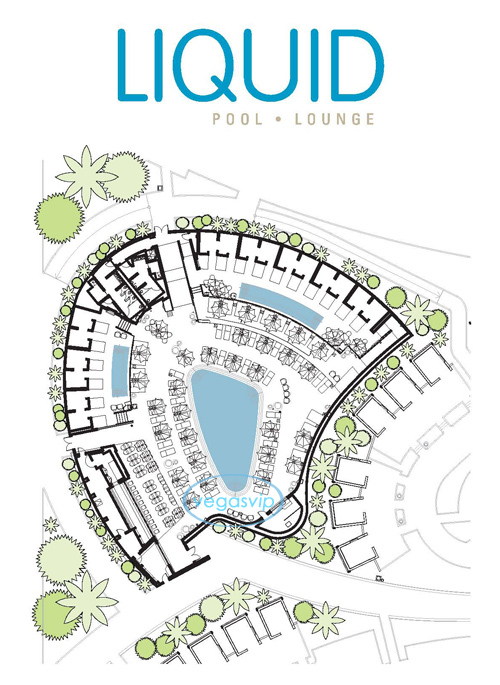 You’ll still get your bar, stuffed to the gills with a fine assortment of varying liquors, your comfortable seating areas, and the refreshing pool that you came for. Despite its size, everything is still in place. Since this pool is a little smaller than usual, you may start to feel a spout of claustrophobia coming on. If this happens, know that you can always plan ahead of time and rent yourself a cabana to escape to. Set throughout the perimeter of the entire establishment, cabana’s give you a private space while still ensuring you’re never too far from the party. Included in your cabana are two plasma televisions, equipped with a PlayStation 3 and an assortment of games, two daybeds, and access to your own private pool. Not sure about cabana pricing? 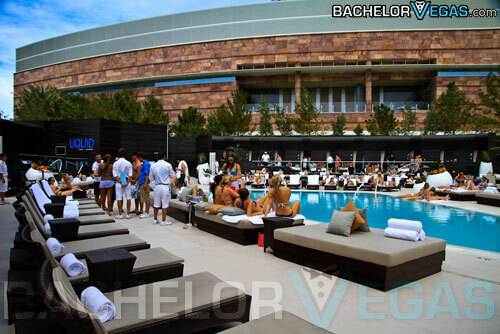 Let Bachelor Vegas handle it for you! One thing that sets this pool apart from the rest of the pool parties in town is its inclusion of food. While alcoholic beverages are always an option, oftentimes it’s impossible to find a venue that will also curb your appetite. Dine on some fresh fish tacos and other succulent lunch options before kicking back by the pool and rejoining the party. It provides every aspect of a pool party one could ask for with the added benefit of being small enough to avoid a loud, obnoxious crowd. 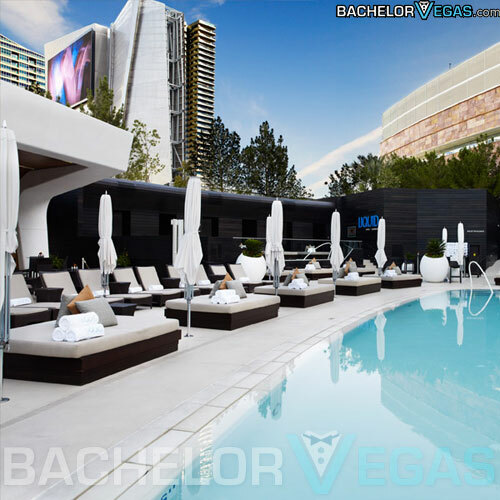 To get the most out of your time, contact BachelorVegas and have them procure you a private cabana. 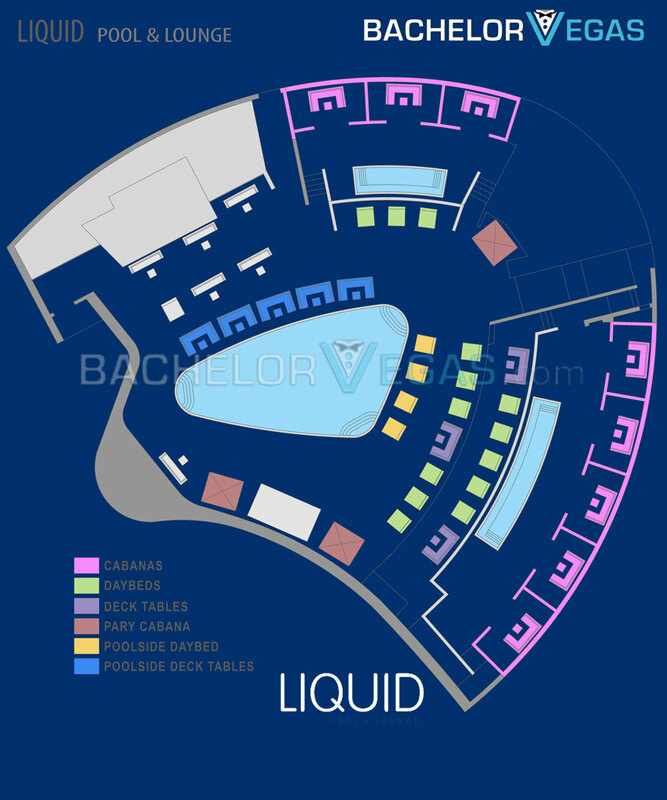 Regardless of how you spend your time, though, Liquid is sure to please. Been to this pool club? 5.0 on Feb 20, review by Stephanie W.
3.5 on Aug 9, review by Adam S.
4.0 on Jun 7, review by Theodore P.
4.0 on Feb 13, review by Editor P.